Diblock amphiphilic copolymers form aggregates in some solvents. Such aggregates exhibit different morphologies, depending mainly on the polar/apolar block ratios. 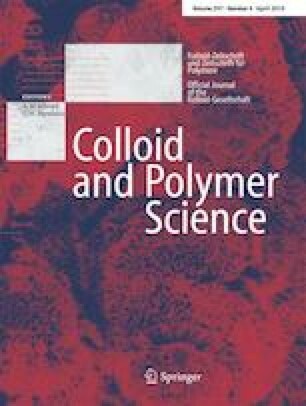 Aggregation of copolymers with polar block excess leads to micelle-like aggregates, known as polymeric micelles, which can be used as vehicles for drug and gene delivery, water decontamination, and catalysis. 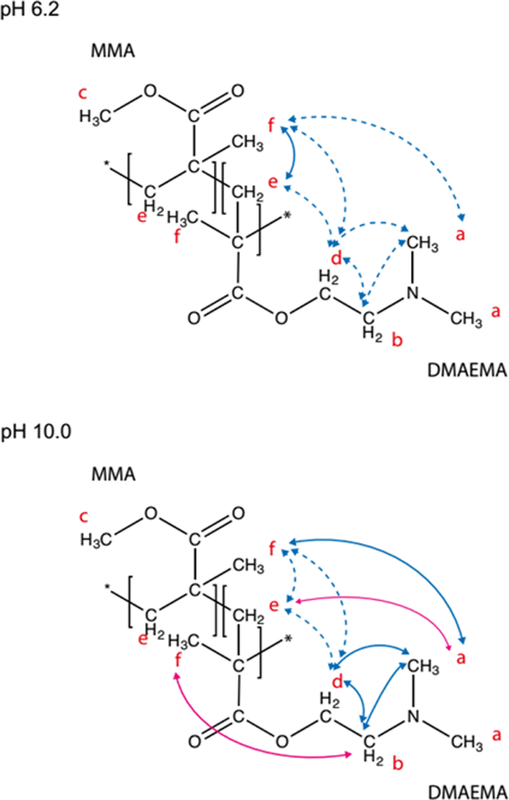 Here, we synthesized by RAFT polymerization three different polymers namely [dimethyl 2-(aminoethyl) methacrylate] (PDMAEMA), poly (methyl methacrylate) (PMMA) copolymers, and PDMAEMA-block-PMMA and characterized their aggregates by NMR spectroscopy and pH titrations. We investigated correlations between their chemical structure, aggregation behavior, protonation degree, and chain conformation in the corona. Decreased amine protonation in the copolymers reduced the electrostatic repulsion, and the apparent pKa of the amino groups approached that of isolated amine. These effects increased compactness and sizes of the polymers and their aggregates at higher pH as reflected by the increased NMR line widths. The online version of this article ( https://doi.org/10.1007/s00396-019-04482-w) contains supplementary material, which is available to authorized users. IMC, HC, and RKS are CNPq research scholars. GKVS acknowledges the Projeto Biocomputacional/CAPES (proc. no. 23038.004630/2014-35) and CNPq (proc. 457733/2014-4). FAPESP (grant number 2013/08166-5 and 2016/07490-1). IMC has been supported by the INCT-FCx (Instituto Nacional de Ciência e Tecnologia de Fluidos Complexos (CNPq/CAPES/FINEP/FAPESP) and NAP-FCx (Núcleo de Apoio à Pesquisa de Fluidos Complexos da Universidade de São Paulo).